There are 23 Assisted Living Facilities in the Keizer area, with 4 in Keizer and 19 nearby. The average cost of assisted living in Keizer is $3,645 per month. This is higher than the national median of $3,346. Cheaper nearby regions include Salem with an average starting cost of $3,335. To help you with your search, browse the 120 reviews below for assisted living facilities in Keizer. On average, consumers rate assisted living in Keizer 4.2 out of 5 stars. Better rated regions include Mcminnville with an average rating of 4.6 out of 5 stars. Caring.com has helped thousands of families find high-quality senior care. To speak with one of our Family Advisors about assisted living options and costs in Keizer, call (855) 863-8283. Sweet Bye N Bye, Inc.
Keizer, Oregon, is home to the 45th Parallel Monument, which marks the latitude line that puts Keizer halfway between the equator and the north pole. Seniors can visit local attractions, shop in the nearby city of Salem, and choose from four Assisted Living Facilities (ALFs) within city limits, and 31 in the surrounding area. ALFs are provide dignified care and supervision to elderly residents, in addition to services such as medication management and social activities. These licensing and regulation of these facilities is governed by the State of Oregon Department of Health and Human Services. Seniors and their loved ones can feel safe and secure due to the low crime rates. Violent crime in Keizer is rated at 14 out of 100 (1 being the safest) which is quite a bit lower than the national average of 31.1. Property crime is at 34.8, which is also lower than the national average of 38.1. Keizer has a cost of living rate that is 10.8 percent higher than the national average. Seniors may have slight difficulty building their savings living here. Seniors who are active and enjoy the outdoor activities may enjoy living in Keizer due to the mild climate. With pleasant summers that average a high temperature of 82 degrees, seniors can enjoy outdoor activities with ease. Winters only have an annual snowfall of four inches, and the average low is 35 degrees, so seniors with limited mobility can be active most of the year. Keizer has no facilities from which to choose in the event of a medical emergency or illness, with the nearest major hospital, Salem Health, located in Salem. Seniors seeking transportation for shopping, dining or doctor’s appointments can use the Cherriots public transportation, with routes throughout the Salem-Keizer area. Seniors receive a discount for this service. Seniors can visit the Keizer Heritage Community Center, a 1916 Craftsmanship style house known as “Old Keizer School.” Seniors can also visit the historic Spongs Landing Park where a steamboat and ferry used to operate. Now it features great swimming, and walking trails for seniors who like to enjoy nature. Assisted Living costs in Keizer start around $3,645 per month on average, while the nationwide average cost of assisted living is $4,000 per month, according to the latest figures from Genworth’s Cost of Care Survey. It’s important to note that assisted living rates in Keizer and the surrounding suburbs can vary widely based on factors such as location, the level of care needed, apartment size and the types of amenities offered at each community. Seniors on a budget can get help paying for assisted living services through Medicaid under Oregon’s Community First Choice (CFC) plan, or K Plan. 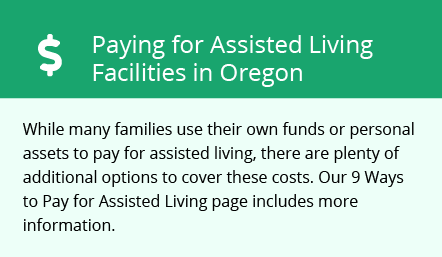 In Oregon, there are no non-Medicaid programs available to cover assisted living costs. Keizer and the surrounding area are home to numerous government agencies and non-profit organizations offering help for seniors searching for or currently residing in an assisted living community. These organizations can also provide assistance in a number of other eldercare services such as geriatric care management, elder law advice, estate planning, finding home care and health and wellness programs. To see a list of free assisted living resources in Keizer, please visit our Assisted Living in Oregon page. Keizer-area assisted living communities must adhere to the comprehensive set of state laws and regulations that all assisted living communities in Oregon are required to follow. Visit our Assisted Living in Oregon page for more information about these laws.